Protection against flats for serious off-road racers. Made from a multi-cellular butyl material, Bib Mousse replaces conventional tubes, providing a pressure equivalent of approximately 13 PSI. Specifically designed for off-road competition use, at speeds up to 80 mph. Use only with Michelin off-road tires. 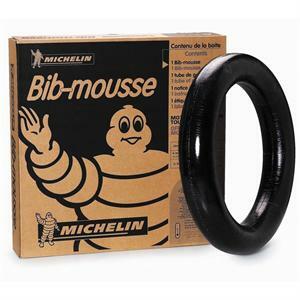 Because Bib Mousse is shaped for a perfect fit inside Michelin tires, use of Bib Mousse with other brands of tires can lead to handling instability and possible destruction of Bib Mousse. Each Bib Mousse includes a tube of Bib Mousse fitting gel.